The Hunchback of Notre-Dame, or Notre-Dame de Paris (1831) if you prefer the original French title, is storytelling at its best. 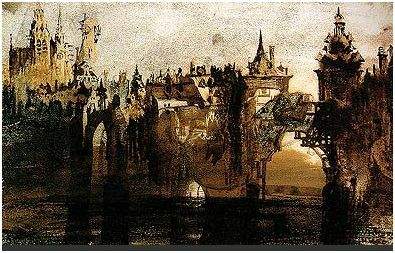 I’m sure Victor Hugo would be pleased to know that 181 years after first printing, he continues to make people like me miserable thinking about the tragic Quasimodo and the love of his life, Esmeralda. 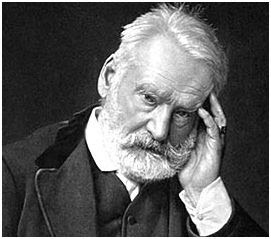 I’m a huge Victor Hugo fan but I don’t think I can take much more of him. Notre-Dame de Paris was bad enough, but add to it Les Misérables (1862) and I’m totally, well, misérable. In this book it’s poor Jean Valjean who does the suffering for stealing bread during hard times, and is haunted and hunted for his remaining years. Victor Hugo thinking. And thinking. And thinking. A glutton for punishment I’ve read both books more than once and although I keep copies, I doubt I’ll ever read them in their entirety again. Maybe a chapter here and there, but I just can’t go through all that heartbreak one more time. I might get brave and try out some of Hugo’s other books. Surely he wrote something that doesn’t make me feel like I’ve just been hit by a car. One of the titles The Man Who Laughs has promise…..but I have the feeling it’s a trick and I’ll end up swearing off Hugo one more time. I already know how The Last Day of A Condemned Man will end without so much as opening the cover. In the Marais quarter of Paris, you can visit the Maison Victor Hugo at No. 6 Place des Vosges, one of the oldest squares in Paris. Hugo lived here from 1832 to 1848 and his apartment has been turned into a charming museum which holds his personal ephemera, furniture, drawings and manuscripts. It was here that he wrote “Les Misérables”. 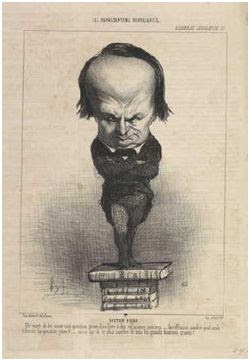 Daumier portrayed Hugo with a swelled head. Unlike his books, the museum is not at all depressing unless you count Hugo’s magnificent talent which, quite frankly, seems to be a bit much for one person. Seeing all that this man accomplished, most people leave the museum feeling they should paint, write or at the very least get elected to some National Assembly before time runs out. It's Camerom Macintosh the gets me down Les Mis looks like it might run longer than the Mouse Trap. Not possible! I see that St Martins Theatre is celebrating the 60th Anniversary of Mouse Trap - over 24,000 performances. That's amazing. But, you can't go wrong with Agatha Christie.